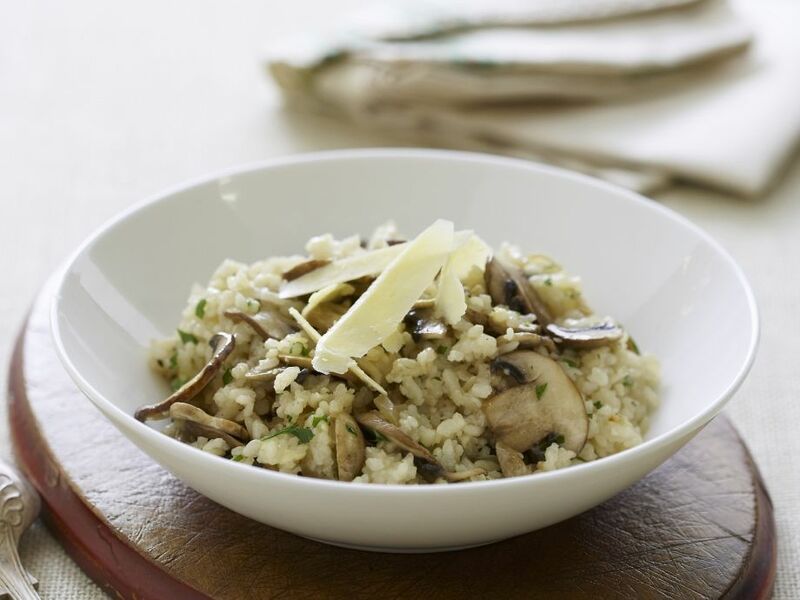 Risotto with Mushrooms - An always tasty combination: crunchy mushrooms and earthy rice. 1 Ceps in 300 ml of hot water and soak for about 10 minutes. Rinse mushrooms and cut into slices. Peel onion and chop finely. 2 Drain porcini. Chop mushrooms to liking. 3 Heat oil in a pan. Braise onion until soft over medium heat. Add rice and sauté. 4 Add wine and boil, stirring constantly. Pour 150 ml of vegetable broth and cook, stirring frequently, until almost all liquid is absorbed. Continue to add broth in this manner and cook until rice is al dente, about 20 minutes, stirring frequently. 5 Chop pine nuts coarsely and toast in a dry frying pan over medium heat until fragrant. Grate parmesan. Rinse parsley, shake dry and chop leaves. 6 Stir half of the parmesan, pine nuts, parsely and mushrooms into the risotto and season with salt and pepper. Season with porcini powder and let sit for 3-4 minutes. Distribute risotto on 4 plates and add remaining parmesan. Serve.